Well, the past six weeks have certainly flown by. My daughter and I have had a blast working on her new room together for the One Room Challenge. 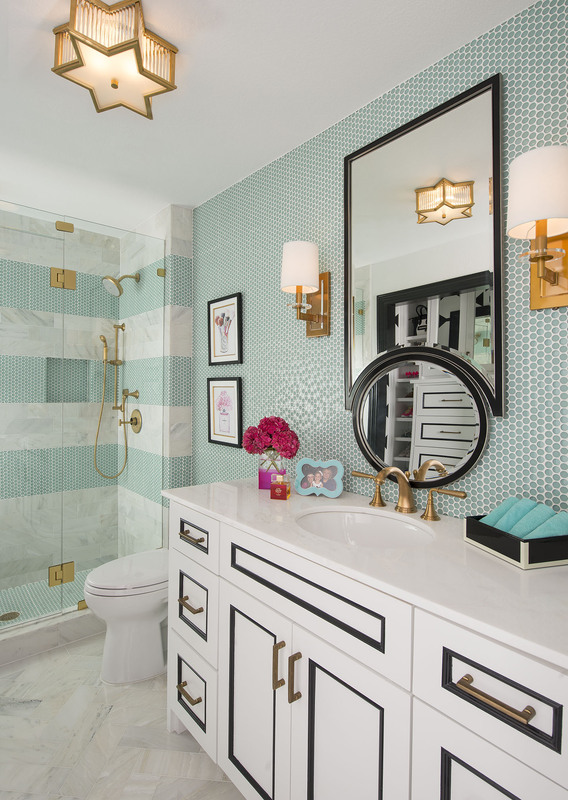 There are many challenges of creating & executing a custom design for a room in just six short weeks. Lucky for me, I have access to a multitude of resources at IBB. Even with the best resources, you can still face backorders, items no longer being available & construction delays. 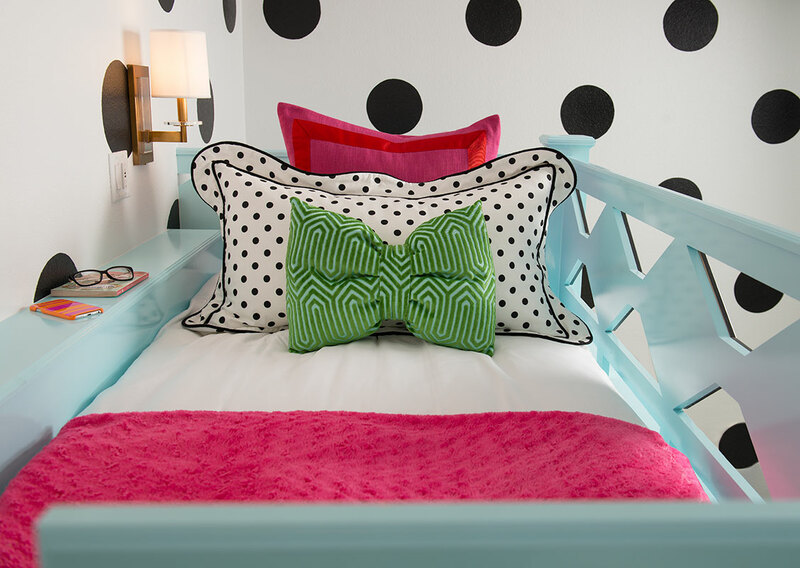 I knew my longest lead time would be the custom daybed from CR Laine (more on that later). The biggest part of this challenge for me was definitely the balancing act of client work and working on a project in my own home. This is always a dilemma and the reason that projects at Casa de Geyer usually go to the bottom of the list. I honestly couldn’t have done it without my amazing contractor, Lonnie Gray, of Lonnie Gray Custom Homes. I have worked with Lonnie on several client projects and he also worked with us on my mom’s remodel. Early morning & late night meetings worked out perfectly and he was on top of every detail of my design. It truly takes a village and he has the most amazing team of craftsman. I know you’re ready for me to get to the point & start revealing some photos, so let’s get to it! 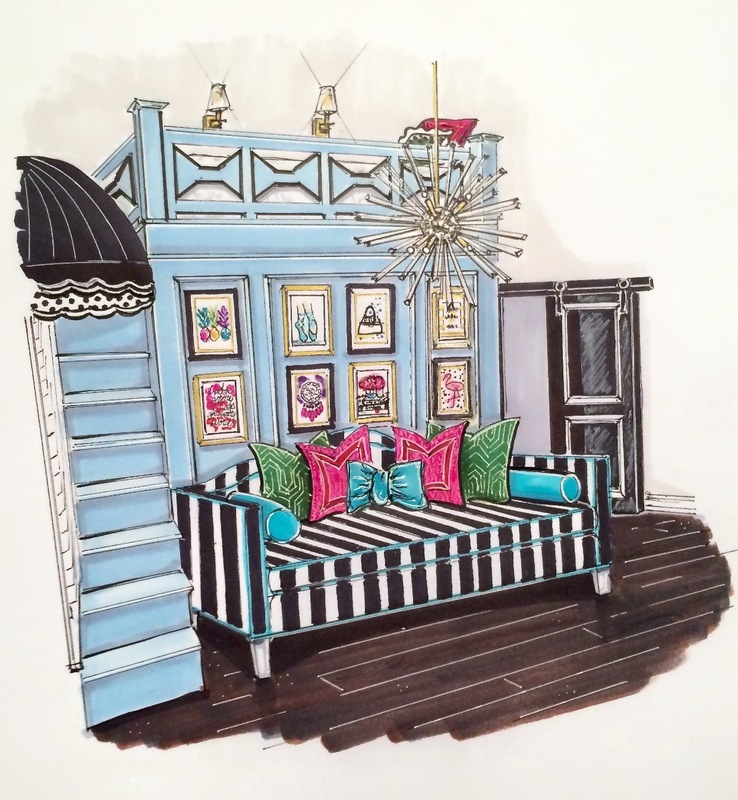 First of all, I’ve been dying to show you the renderings that I had my friend Jane Gianarelli do for the concept of Jaylie’s room design. 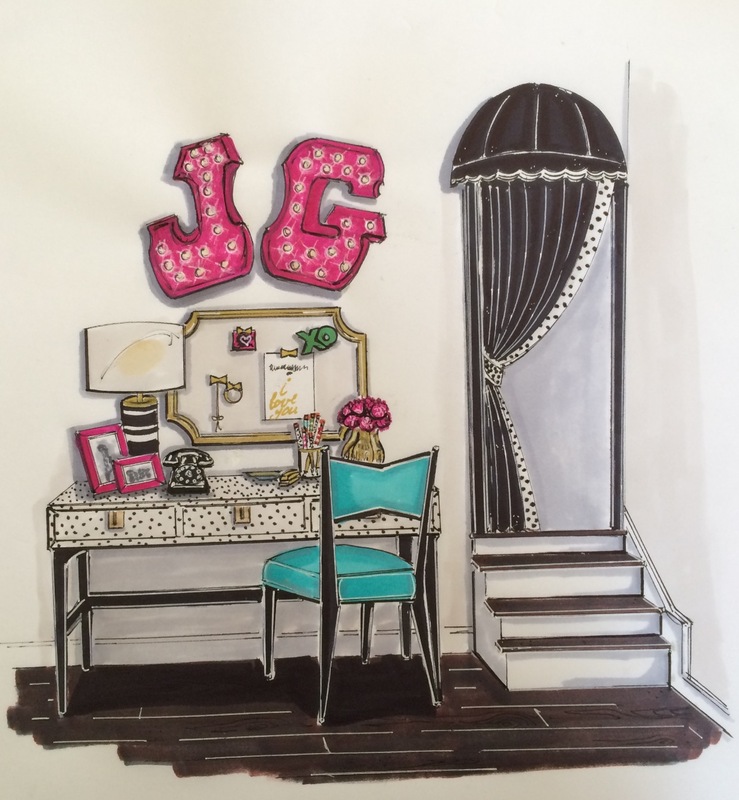 After a few emails & phone calls discussing all of the pieces, design elements & the floor plan, Jane sent over the beautiful renderings for my design for Jaylie’s room. Rendering is definitely not a strength I possess, so it certainly pays to have talented friends like Jane! 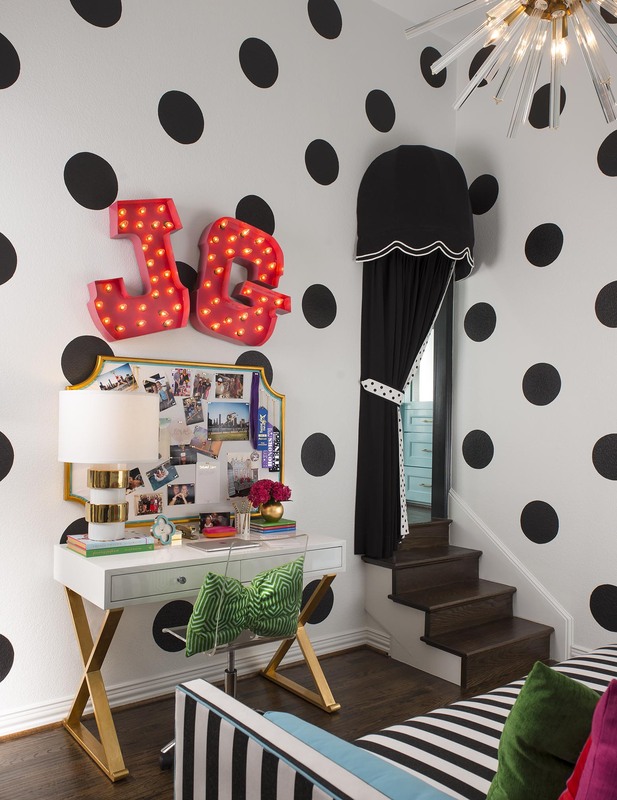 And here is Jaylie’s actual room  I ended up adding the large scaled polka dots to the four walls in the room at the last minute & I think they really kicked the room up a notch. James Peck did an awesome job with all of the decorative painting in the room! Check it out! Do you notice the fabulous day bed?  Woohoo! My friends at CR Laine really came thru for us & got it to us just in time for the big reveal! We created a gallery wall above the daybed using various prints my daughter selected from Etsy. I had them framed locally along with Kate Spade & Tory Burch shopping bags. I designed the window treatments to look like boutique store awnings. 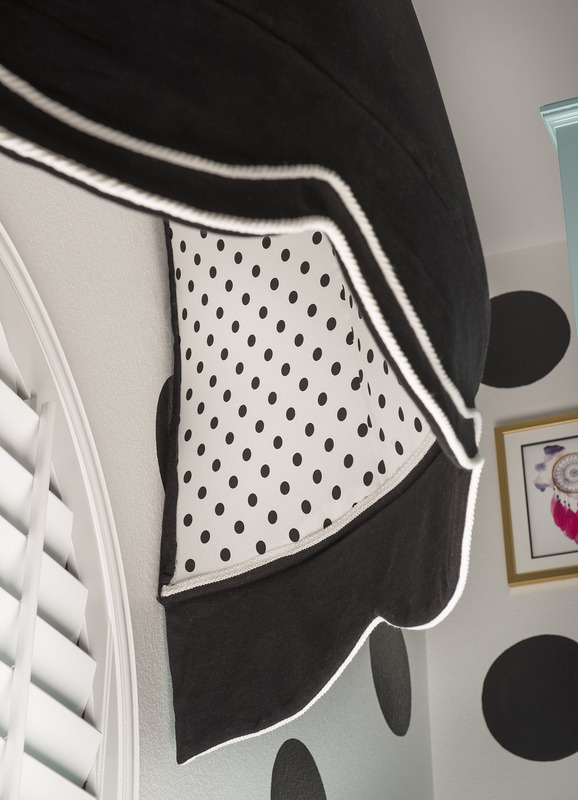 We used the black & white polka dot on the inside since it’s visible from many angles in the room. Inside her closet, she has 2 sections to hang clothes. One section was divided in half for shirts on the top & jeans & pants on the bottom. The other section (which you can’t see in this photo) has an area for long hanging and an area for skirts and shorts. All of the closet rods & shelves are adjustable so we can change them in the future as her storage needs change. I used peg board across the entire back wall for her to use to hang accessories. Since we added the closet under the loft bed in her room, we turned her original closet into storage for her shoes and drawers for pajamas and tshirts. I had our decorative painter paint the bow pattern in here and I added the black inset on the cabinetry. It really makes the brass hardware stand out. 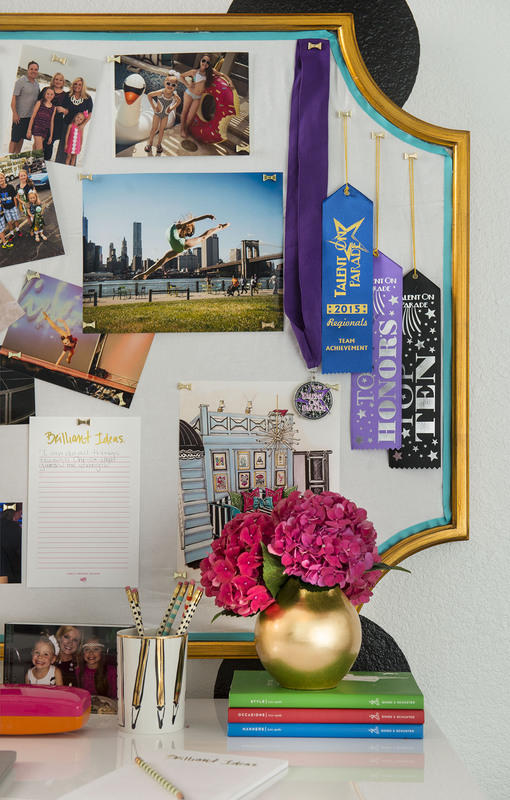 We used her “JG” letters from her old bedroom above a cork board in her desk area. Since the polka dot Kate Spade desk and bow desk chair were new introductions, it won’t be shipping for a while so we borrowed this desk from another room for the time being. She had the acrylic desk chair in her previous room as well. They both actually work perfectly too! 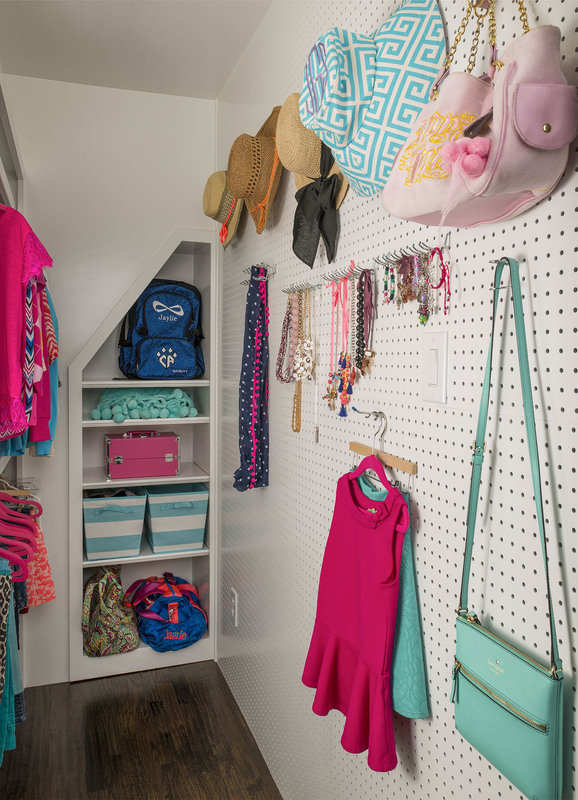 The bonus room at the top of the stairs in her bedroom was turned into a vanity area with more cabinetry for storage for all of her dance and cheer clothes. I mirrored the cabinetry doors and the back wall to help visually enlarge the space. I hope you all have enjoyed the Big Reveal of Jaylie’s new Kate Spade inspired bedroom. She is super excited about how it all came together & all of her new storage. A HUGE thank you to my friend Dan Piassick for photographing the room & getting these amazing photos to me so quickly! Thank you all for following along on our journey of the six week One Room Challenge and allowing us to share this project with you. Check out what the other participants have to share with their reveals!